Spring has nearly sprung, and these ICOs are ready to do the same. Check out our 6 ICOs to watch in April, and let us know if you’re considering joining their whitelists in the comment section below. These days, the blockchain consists of all kinds of industries and fields, and lately we’ve seen a rise in medical solutions. Enter Iryo Network, whose solution is four-sided for medical staff, patients, researchers and clinical managers. And what exactly are they aiming to do? For patients, they aim to provide ‘complete access and control over one’s medical record’, unparalleled security and interconnected systems which helps facilitate treatment. On the other hand, for medical staff, it provides a single-entry system, a user-friendly platform and crucial IT support. For researchers, it focuses on augmented research capabilities, access to a large amounts of medical data and lower costs. Lastly, for clinical managers, the platform provides flexibility when it comes to multi-vendor options, lower admin costs and zero-knowledge security. They strongly believe that medical data should be decentralized. 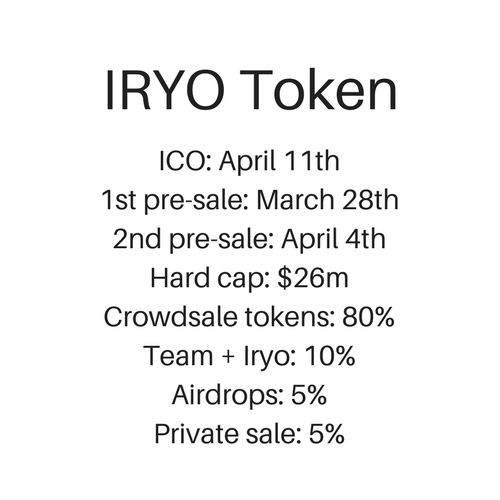 The IRYO token holds incentives which promote ‘elevated levels of medical research’. Patients are rewarded with tokens when they have their medical histories anonymously analysed, and they are in turn able to spend the tokens to pay for medical services in the clinics. The team behind Iryo consists of CEO Vasja Bočko who has a background in corporate finance, investments and product development for companies including UniCredit, 3fs, and Bitstamp. With him on the team is CTO and senior developer Dominik Žnidar, Head of Strategic Development Peter Kuralt and CMO Domen Savič, in addition to others. The issues with a large percentage of charitable donations being given to the middle man have been up for debate for the past decade. People are increasingly looking for ways to support their worthy causes without the majority of the money disappearing into fees and high salaries of the CEOs of the organisations. That’s the beauty of the blockchain, which aims to cut out the middle man, and especially when it comes to ICOs like Cherr.io. That’s why they’ve launched a worldwide, decentralized donation platform which enables people to give directly to the causes they want to support. 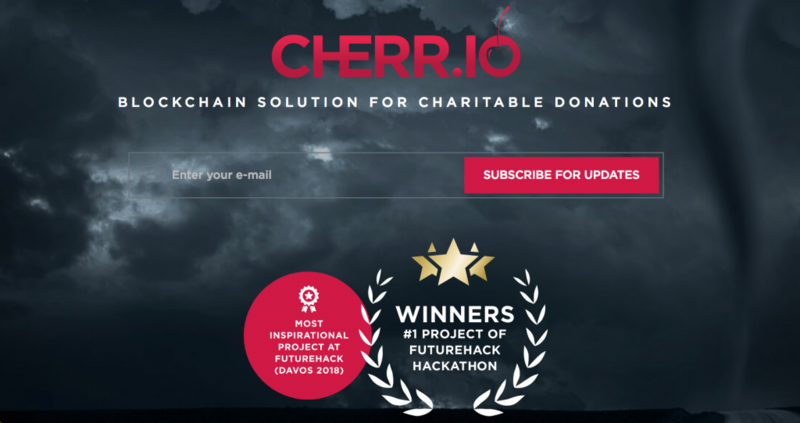 Cherr.io focuses on ‘increasing transparency and reinforcing trust back to the people’, which is why they’ve launched an ICO for charitable donations. They are aiming to make their technology available to all charitable organisations which aims to increase transparency and efficiency. The size of the charity market is enormous. Every year, approximately $500bn USD is donated to charities in the top six countries, and there are 1.2m charities registered and operating worldwide. As winners of the Project of Futurehack Hackathon 2018, these guys know what they are doing. Slovenian co-founder trio David Tacer, Mario Markovic and Aljaz Straser have backgrounds as blockchain and ICO advisors, developers and software engineers. 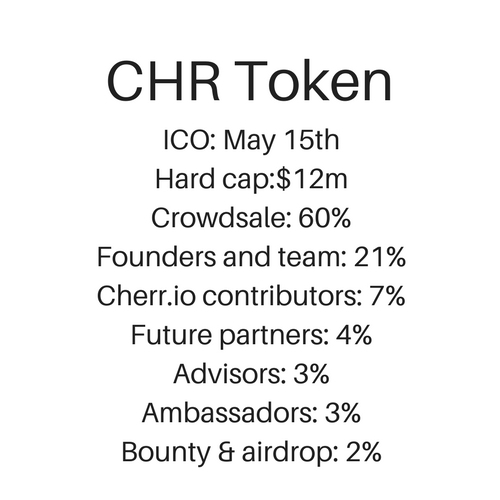 What is the utility of the CHR token? The utility of the token is to serve as a ‘fuel driving all participants to show their best charitable effort’. The community will be rewarded with tokens for advertising their chosen charities on their social networks – and this reward relies on the success of the campaign. This takes away the marketing budget for a charity campaign, as fundraising campaigns will be facilitated by the people in the community. Messaging platforms are increasingly popular ways to communicate in the business world today, with many companies working across several cities, countries and even continents. Rather than the traditional use of e-mails, companies see the value in the quick messaging platforms currently provided by companies such as Slack, Skype, Google Hangouts and Telegram. It was only a matter of time until there was a decentralized messaging platform, and that’s exactly where Mainframe comes in – a movement, rather than an ICO, according to CEO and founder Mick Hagen. And they are now physically airdropping about $1m worth of MFT tokens throughout cities all over the world. Mainframe will be visiting about 25 cities, where people will have to physically be there to participate, as the airdropped tokens will be redeemable for MFT. The company is building a censorship-resistant platform for businesses, ensuring the highest possible security – which is so crucial, as many other platforms can be vulnerable to hacking these days. Mainframe’s five principles are built on encryption, dark routing, peer-to-peer architecture and interoperability. The company believes that users ‘should have access to and control of your own data online’, and that ‘the tools you use should empower you to reveal and share only what you choose’. The first messaging application on the network – Onyx – has already been built, which serves as a decentralized workplace messaging tool. 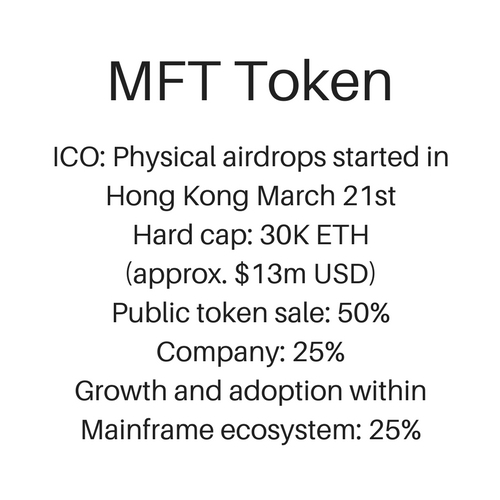 What is the utility of the MFT token? The utility of the Mainframe token is to incentivize and reward Mainframe Nodes, which will be rewarded with MFT tokens. They will be favouring people who will be using the network, which is why they are having a private pre-sale for a limited number of people. Mainframe comprises of a team of 12, and the majority has been in the crypto space for quite a while. Hagen is the founder of the company Zinch, and CTO Carl Youngblood has spent the last twenty years as a full stack engineer. They’ve also got Business Development & Sales (and Co-Founder of Zinch), Brad Hagen on the team. The remaining team’s backgrounds are as developers, engineers and designers. For more information about Mainframe, click here. 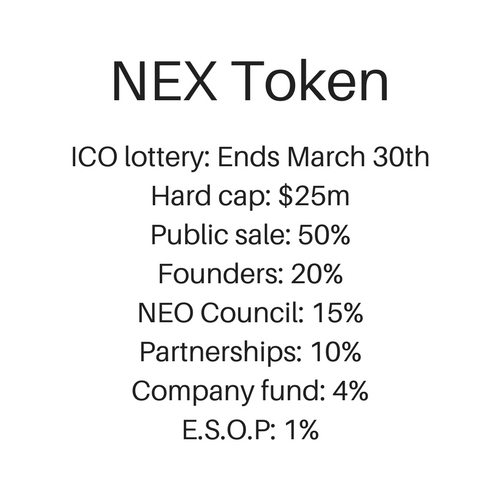 Built on the NEO blockchain, NEX is a decentralised exchange such as Airswap and Kyber Network, for cryptographic trade and payment service creation. According to the company, ‘the system consists of three main components: an off-chain trade matching engine, a smart contract where trades are executed, and a payment service where global assets such as NEO and GAS can be converted to tokens that can be transferred directly by smart contracts, making them compatible with the exchange’. Instead of a traditional crowdsale, the ICO is currently doing a lottery. What is an ICO lottery? The lottery for the tokens is random – and any participants have an equal chance of winning, as long as their entries are received before March 30th, 18:00 UTC. The following countries cannot participate: Algeria, Bolivia, Vietnam, Indonesia, Kyrgyzstan, Lebanon, Morocco, Namibia, Nepal, Pakistan, Ecuador, Myanmar, Ivory Coast, Cuba, Iran, North Korea, Syria. It is still uncertain whether USA, China and South Korea can participate in the ICO. Users will be rewarded with tokens when people use the payment service. The five co-founders behind NEX are all developers: Fabio C. Canesin, Fabian Wahle, Ethan Fast, Luciano Engel and Thomas Saunders. Their backgrounds range from designing for Fortune 500 companies, co-founding CoZ, creating NEON Wallet and designing for Alexa 500 websites. 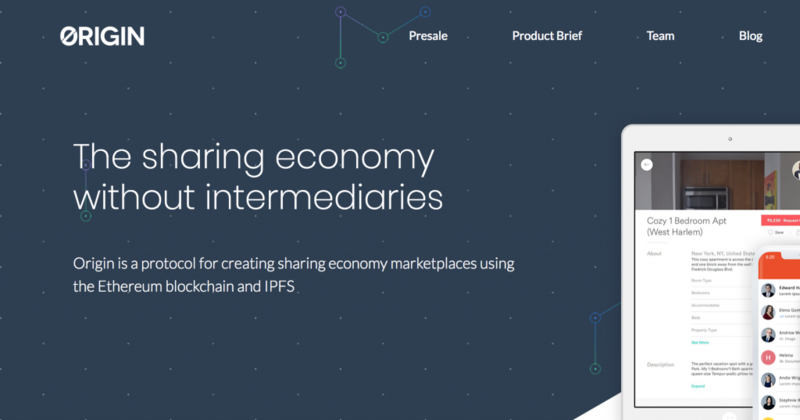 Sharing economy marketplace Origin Protocol is targeting industries including car-sharing, home-sharing and service-based tasks with its protocols that allows sellers and buyers to transact on a decentralized platform. They are particularly targeting companies such as AirBnB, Craigslist and Postmates in a bid to promote transparency and collaboration. They also encourage other technologists, businesses and consumers to ‘build, contribute and extend the ecosystem’ with them. The company believes that they promote personal liberty by preventing central corporations and government to impose arbitrary rules. 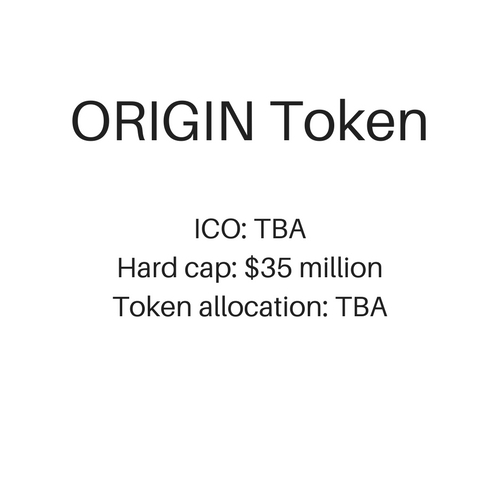 The Origin token is a multi-purpose token, which will be the unit of exchange between buyers and sellers. There will be both positive and negative incentives ‘to ensure platform security, data validity, engagement, and growth’, according to the company. It also allows the community to participate in network governance. Made up of entrepreneurs, engineers and blockchain experts, Origin’s Co-Founders Josh Fraser and Matthew Liu boast an impressive background. Fraser started coding at only 10 years old and has co-founded three other venture-backed companies: EventVue, Torbit and Forage. Liu was the 3rd PM at YouTube and VP PM at Qwiki and Bonobos. They are joined by senior engineer Stan James, Andrew Hyde in Community, Coleman Maher in Partnerships and Jon Hearty in Business Development. Essentia aims to provide users with a single place to access their dApps, identities, assets and data. They believe that the fact that data and platforms are being dotted around in many different places provides a huge issue – for many different reasons. One of these, is that it prevents these pieces of information from working together. And Essentia aims to fix that. The platform is made up of two main components: essences, which interlinks data across multiple services, and synergies, which is the connective tissue linking platforms, resources and modules. The platform also provides users with the ability to add dApps, platforms and wallets, it can support millions of users at the same time and allows users to take full control of their data. It also supports Bitcoin, Ethereum and other blockchains and uses verification procedures safely. It can be used by both individuals, with decentralized passwordless logins and KYC registrations, and by companies through GDPR compliance and oracles for smart contracts. What is the utility of the ESS token? There are a number of rewards being given through the ESS token. Firstly, it works as fuel for the platform and lets users access, maintain or use specific components, features or services. Users can also pay for extra internal resources with the tokens, and can be used to pay for extra internal resources, renting additional decentralized third-party resources connected to the company. Additionally, it can be used to pay for generic third-party services connected to Essentia, and for goods, services, content or fees on the in-house ESS-Dapp-Centre. Users can also be compensated with tokens when they offer dedicated or additional resources to the network. There are also several other utilities of the tokens, which can be explored in more depth in their whitepaper. The four founders, Matteo Gianpietro Zago, Mirco Mongiardino, Vladimir Holubovych and an anonymous blockchain and architecture lead, all have backgrounds in the cryptocurrency space. Which ICOs are you most excited about following in April? Let us know in the comments below! I reviewed ICOs from this list and Essentia looks really great. On of the most interesting project at all! Nope – none of these 6 ICOs have paid us anything. We always label our sponsored content. What do you think about Elementh.io? They have good rating at ZAZ spreadsheet, Hacked etc. We want our ICO to be listed here too. Please check our social blockchain movement based on managing the waste management system leveraging the help of Coming of ages techs.